Good Morning to you on this extremely cold but sunny and bright Thursday morning! Minus 19 Celsius outside my door at the moment, that is some cold!!!! Waking up on any morning no matter the weather is so stimulating, because in waking you find yourself still in the land of the living for another moment in time, with time to do as you need or please to. Today I choose to sit and sew, now how great is that? I made one trip out of doors this morning to fill up the bird feeder so that my feathered friends will have food today. Miss Black squirrel also came by to stock up on supplies and just as quickly, hurried away again. I have no idea how those creatures of nature survive in such cold weather, it is a wonder to me. A young woodpecker was eating from a suet ball I had hung from the edge of the roof and the chickadees are also busy stocking up. Here is the table topper I made the other day and now I am happily working on putting the place mats together. I have not been buying fabric over the past year in an attempt to deplete my fabric stash, but since moving here and having all of the cardinals around me I just had to have this fabric, so confess to buying a meter of it just for this project. I simply could not walk past it. Once all of the place mats have been pieced I will begin the quilting, while I enjoy the quilting part, I spend a great deal of time deciding just how I want that particular item quilted. Do you spend much of your time in deciding the quilted look you wish to end up with? Last week in my Missouri Star Quilt Co. newsletter there was a link to Jenny's latest tutorial, what fun, a way to make a colorful and simple tablerunner using the binding tool and a chance to use up your scraps. See it above, isn't it a "darling" piece? 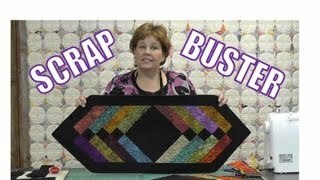 I so enjoy her tutorials, she always makes the project fun and easy. I do not have the binding tool, but I am sure a 45 degree angle cut from your ruler would accomplish the same task instead of having that tool. One day soon I will order one of those binding tools. Time to get myself back to the piecing of the place mats. Thank you for sharing a portion of your time with me today, I sincerely hope you will return and bring along a friend.